Sailing dinghies have lots of ropes, blocks, pulleys, cleats, jammers, halyards, sails, spars… where do you start? Try with our guide on Boat Anatomy. Sailing dinghies, for what they do, are complicated pieces of equipment. Unless you're an absolute genius, it's unlikely you'll get it right the first time you set about rigging one - which is one reason why we're doing our Rigging Guides on this site. Read through all this - and you'll know your halyard from your harken in no time, and won't look a total boom vang when rigging a boat. The basic boat shape that you sit in is called the hull. The front is the bow, the back is the stern. The flat piece at the back is called the transom, which can be either sealed or open in newer, performance boats with self-draining transoms, such as the Buzz, ISO, or most of the RS classes. Self-draining transoms are good when you capsize - the boat comes back up without much water in, otherwise you'll spend some time bailing before sailing off, in boats like GP14s. The sides of the boat are called the gunnels or gunwales, and if there is a covering at the bow (front), its' called the foredeck or just plain deck. So what happens if you don't have a self-draining transom boat? Well, you'll usually find a self-bailer in many boats; this is a small device set in the bottom of the hull, that when pushed down and opened, if you are sailing at a fast enough speed (which doesn't need to be tremendously fast), any water sat in the boat over the open bailer will be sucked out by the pressure difference. Alternatively many closed transom boats will have transom flaps, usually transparent flaps on bungee cord that can be opened to let water out of the back. When you're not sailing along, some boats will have drain points, usually sealed by bungs on the back or a low point of the boat to allow water out. You'll also usually find these somewhere to allow any water out of the boats' buoyancy tanks. Inside the hull, you'll sometimes get seats (in boats such as the Enterprise or Wayfarer), or you may just have a small cockpit instead (Laser), and sidedecks (the side of the boat you can sit on to lean out). If you have a seat running across the width of the boat, it's called a thwart. In all dinghies, in the front centre of the boat, you'll have either a centreboard (which pivots up into the boat) or a daggerboard (which lifts up into the boat). The mast is fixed in front of the centreboard, on a mast step or footing. 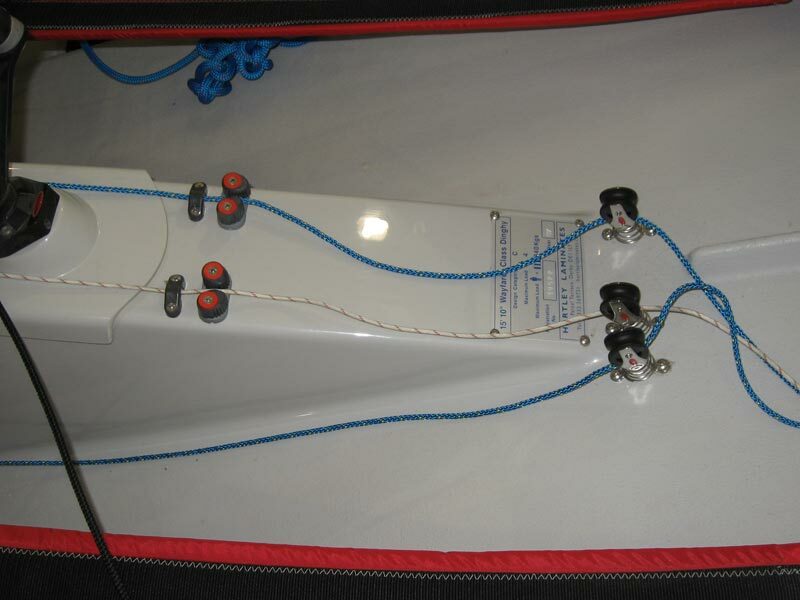 Depending on the boat design, you'll also get buoyancy bags under the seats (e.g. Enterprise), the seats as part of moulded buoyancy tanks (e.g. Enterprise), or no seats and just the sidetanks to sit on (e.g. 420). Some boats will have a buoyancy tank at the front, and may even have a space to stow ropes or some small amounts of gear (the cockpit). 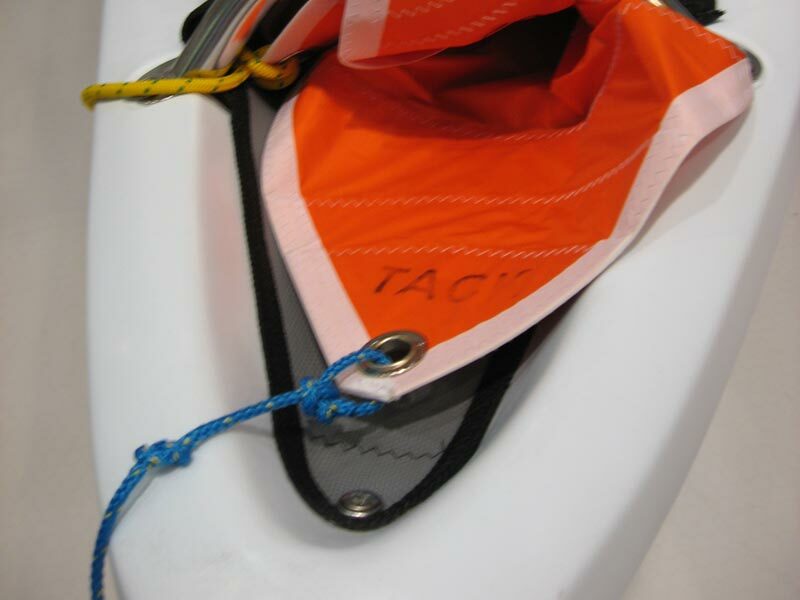 Most boats will also have toe straps inside the boat for hooking your feet under when you hike or lean out of the side of the boat to stop the boat leaning over. 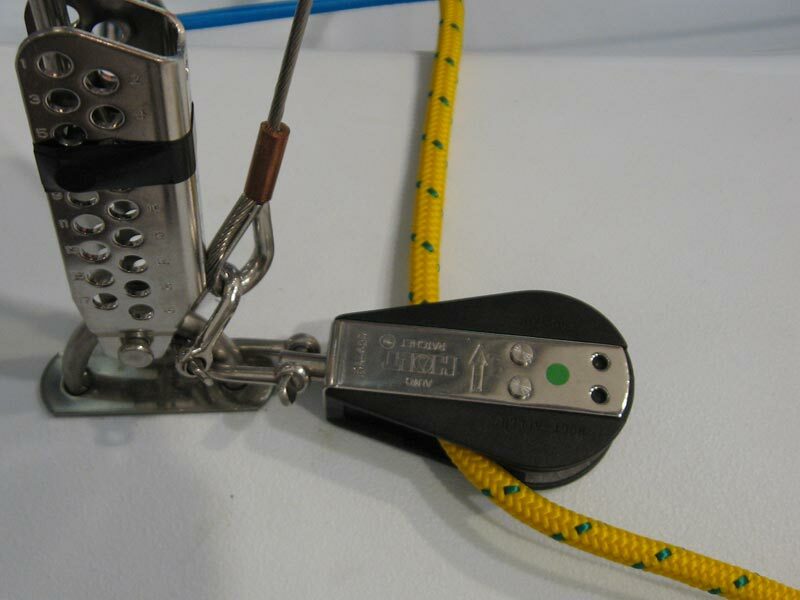 On more modern boats, you can also get a number of fairleads (for ropes to pass through), cleats or jammers (for ropes to jam in) or pulley blocks (for ropes to pass around). 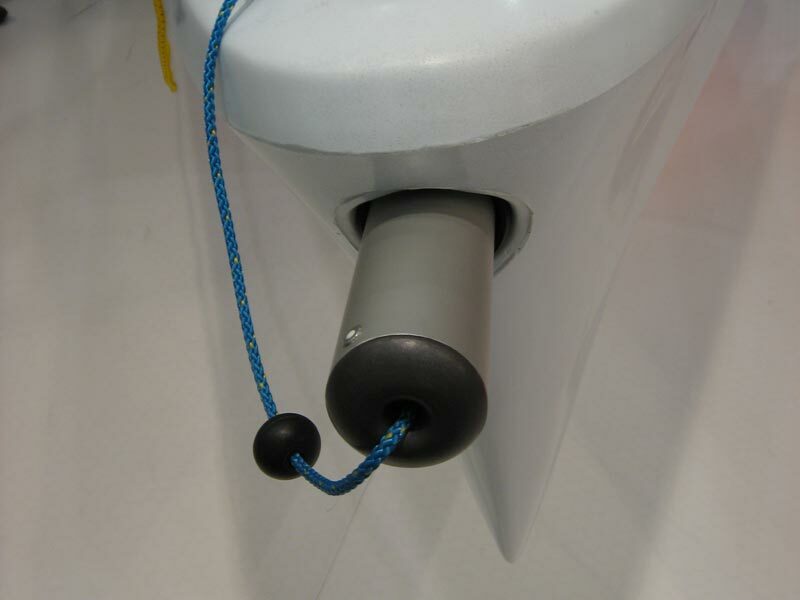 Outside and around the top of the hull, you'll commonly get pulley blocks for spinnakers, and jib fairleads and jammers (for the jib sheets to pass through) sat on jib travellers (which allow you to move the fairlead and jammer forward or backward, see our article on Sail Trim). On single handers such as a Laser or Streaker you'll get eyeholes mounted on the deck at the rear to pass the rope through to form the horse and traveller rope, and usually a fairlead and jammer to jam this rope on. There will also usually be some cleats inside older double handed dinghies, for tying off of halyards and so on. There are three main shapes of boat hull (not counting catamarans or trimarans); the displacement hull, as found on Enterprises, Wayfarers and other similar boats, the modern general purpose hull which are usually flatter, such as the RS200, Laser 2000 or Topper Omega, and skiffs (such as the Musto Skiff or the Olympic 49er). All sailing boats have one thing in common - they all have a mast (amongst other things)! And, you can't miss it - they're usually upwards of 10 feet tall. Sometimes it will be "stepped" on top of the deck, and sometimes it will just go all the way to the hull. In single hander boats like Toppers or Lasers, it usually drops in a hole. In double handed boats, stayed masts are common; there will be a wire called the forestay from the front of the mast (about ¾ of the way up) to the front of the boat, and a wire from ¾ up the mast to either side of the hull, these are called shrouds. The shrouds are usually pushed out further from the mast by spreader bars, a couple of feet down from where they start. The shrouds and forestay can be adjusted (rig tension) to bring the pitch or angle of the mast foreward, backward or from side to side, to adjust the centre of effort of the rig, which has a different effect depending upon it's location over the centreboard. Several feet up from the hull on the mast is usually a fitting called a gooseneck, which is usually a small rod on a universal or bi-directional joint that the end of the boom fits on; the boom is the spar that extends back horizontally from the mast, to which the bottom edge of the sail is attached. Rigging such as shrouds is called standing rigging, on account of the fact it doesn't move much. 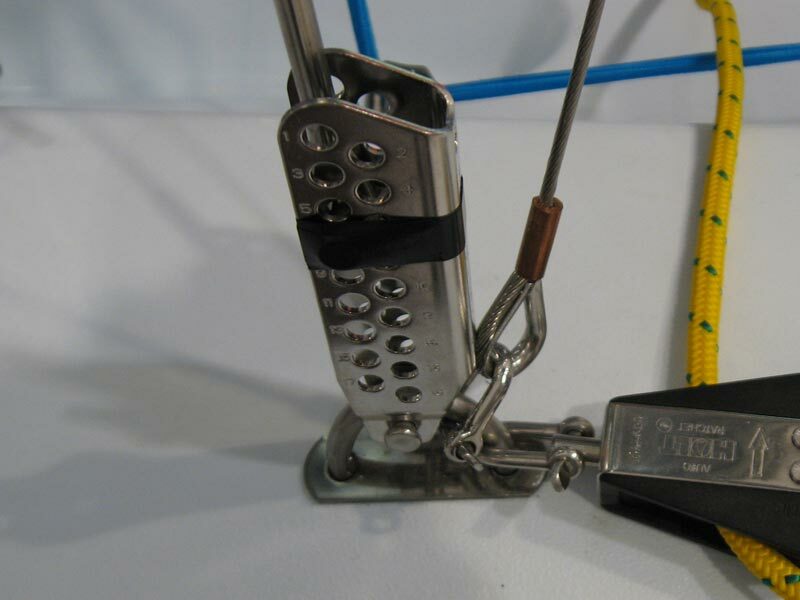 In a similar location off the mast to the shrouds, on performance boats such as some Laser 2 variants or the Topper Spice, you can find trapeze wires; these usually have small handles that can be hooked onto a hook worn on a trapeze harness, and allow the helm or crew or both to hook on, place their feet on the gunwhales and lean out further, to help flatten the boat and stop it heeling over. Single handed dinghies typically only have one sail, known as the main sail, rigged from the mast backwards along the boom. The majority of double handed dinghies will also have a jib sail, which is rigged from the mast forward. 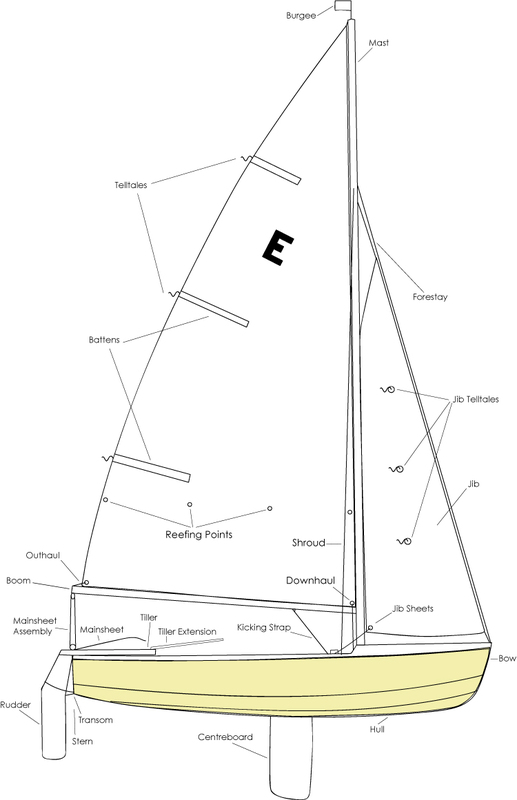 This is the typical Bermudian rig; more detailed information on sails can be found in our Sail Anatomy article. The jib not only delivers extra power but also helps funnel the wind for better effect on the main sail. Many classes of boat have a further sail, known as a spinnaker; these are typically used for when sailing downwind on a run. Traditionally spinnakers were symmetrical in shape, on boats such as the Mirror or Wayfarer. The spinnaker is rigged on the front of the boat, outside of the jib, and is hoisted when sailing downwind, to act as a huge wind sock, filling with wind coming from behind and pushing the boat along. A further spar, known as a spinnaker pole is used to help set the sail out to one side of the boat, and spinnaker sheets pass along the side of the boat and are used to control the set and shape of the spinnaker. 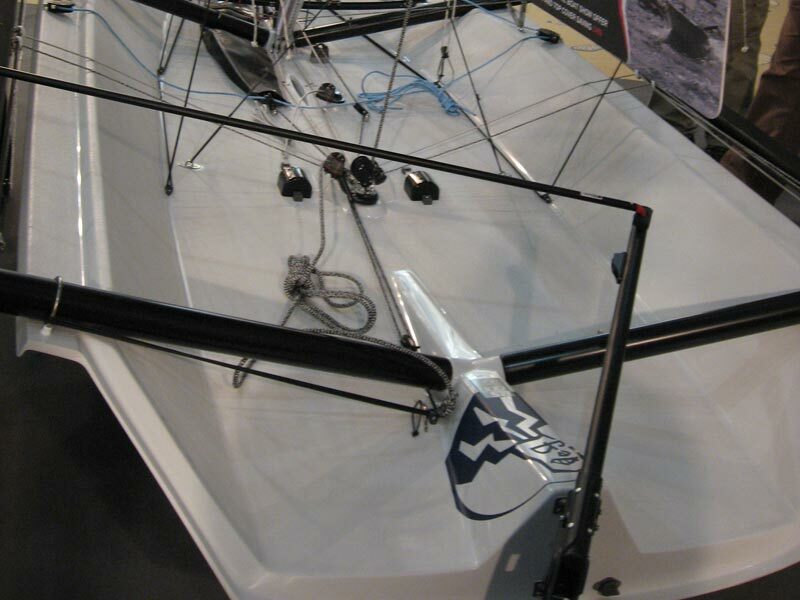 On more modern, performance boats, asymmetrical spinnakers are commonly found, which usually launch from a launch chute or sock on the front of the boat, and are attached to another spar, called a bowsprit, which extends out of the bow of the boat. Due to their positioning and set, asymmetrical spinnakers can be used pointing as high as a beam reach rather than just downwind, and they are typically easier to hoist. 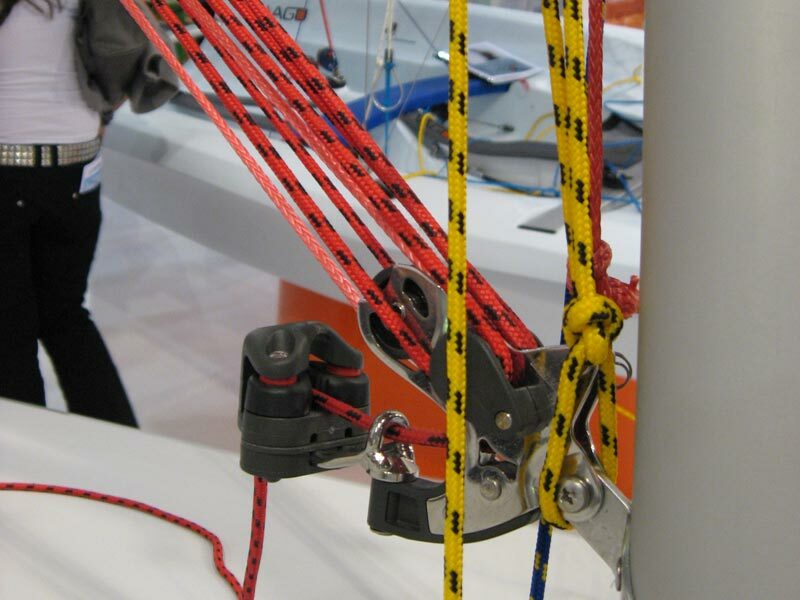 Running rigging on a boat is any sheets or ropes that are attached to pieces of equipment that move; for example the jib sheets, which allow the jib to be pulled to one side or another, or the main sheet. 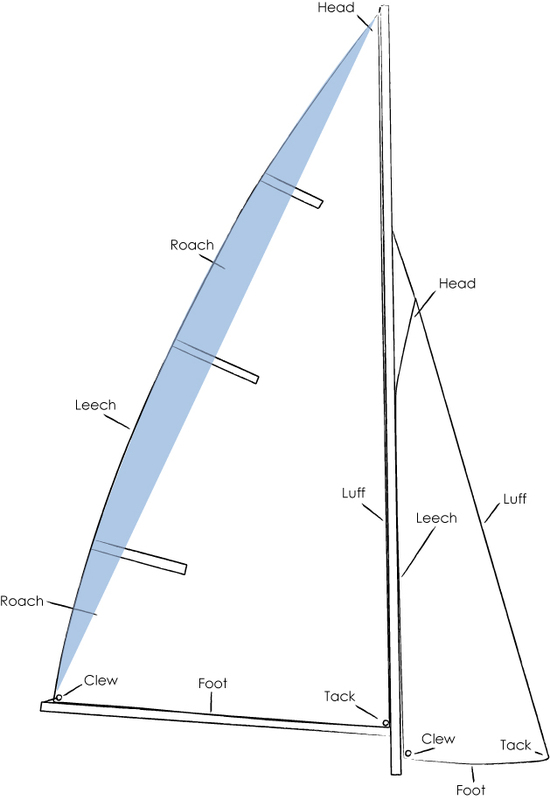 The jib sheets are attached to the clew (bottom back corner) of the jib sail, and are passed one to either side of the boat, typically passing through fairleads and jammers on each side of the boat. The mainsheet can come in two flavours; aft or centre. 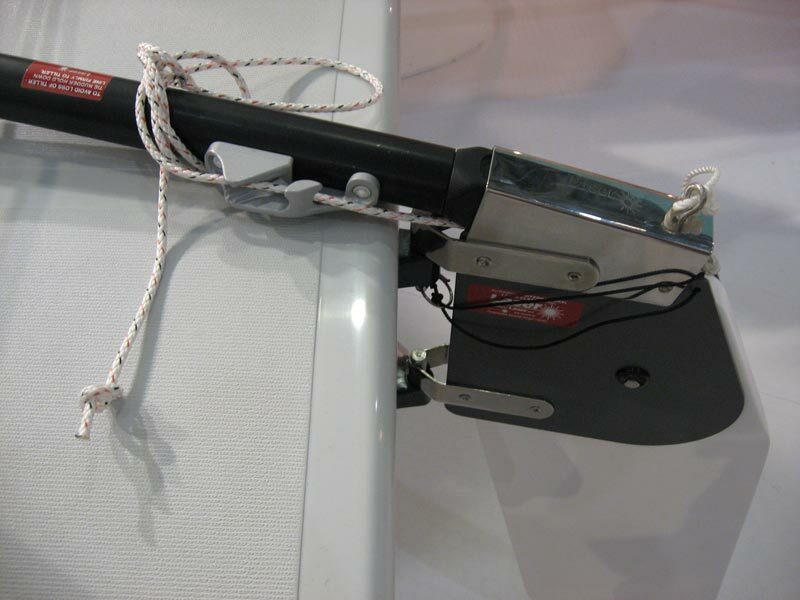 Aft main sheet boats, such as the Enterprise or Mirror, have the mainsheet secured to a pulley on the top of the transom, go up to the bottom of the back of the boom, through another pulley, then back to the transom pulley, then the sheet goes to the helm. Centre main boats have the rope first attached to the pulley on the underneath of the boom, down to a pulley block on the transom, then back up to the pulley on the boom, along the boom through fairleads or eyeholes, through a pulley half way along, then through a larger pulley fixed on the bottom of the cockpit inside the hull (e.g. on a Laser). Alternatively some boats have all of the pulley arrangement on the middle of the boom and not on the end, such as in the 420. Spinnakers can have their blocks in different places on a boat; either on the sides of the hull, or even on the inside of the hull. 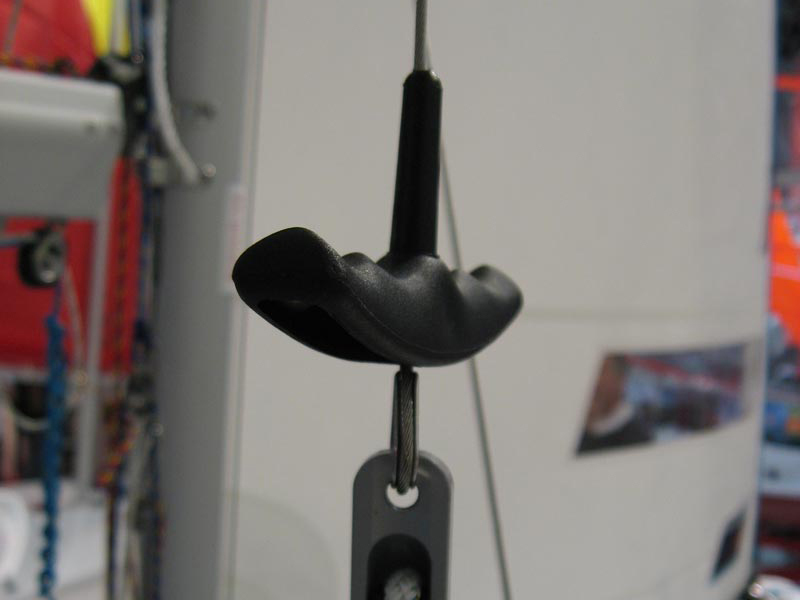 The other notable piece of running rigging is the halyards; these are used to hoist sails (mostly in double handers), and typically run up the inside of the mast, and are cleated off or tied off at the base of the mast, in jammers or around cleats. 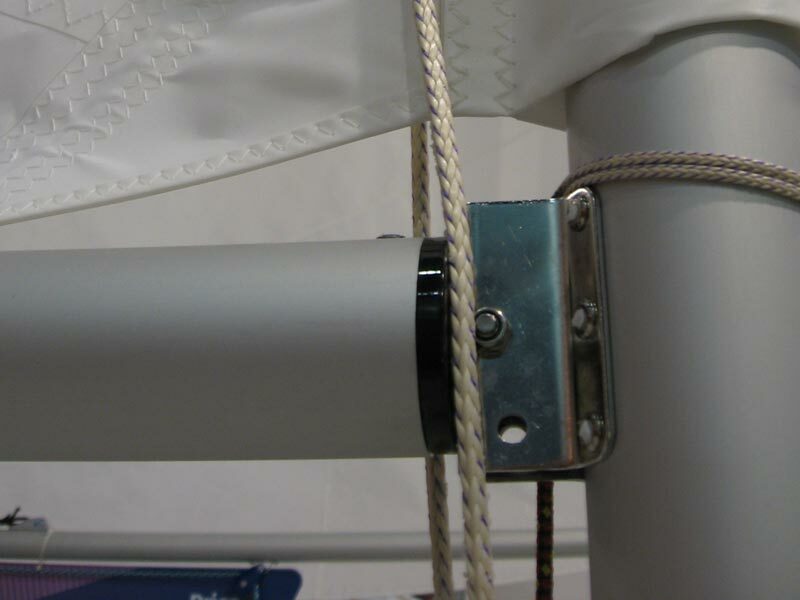 The kicking strap, or boom vang is a rope and block arrangement fixed between the base of the mast, and a point about a yard out from the mast on the underside of the boom; this can be with various kickers and jammers, and allow the crew or helm to adjust how much the boom is pulled down (see article on Sail Trim). Foils in a boat are flat edges that move through the water, either generating stability or giving control. The typical three are the daggerboard, centreboard and rudder. The daggerboard or centreboard serves several purposes; generating an opposing force to lift to give speed, causing resistance against sideways movement, and giving stability to the boat. See our article on Centreboards for more information. The rudder is attached to the back of the boat, controls the direction the boat goes in, and is controlled by the tiller, usually secured to the top of the rudder. 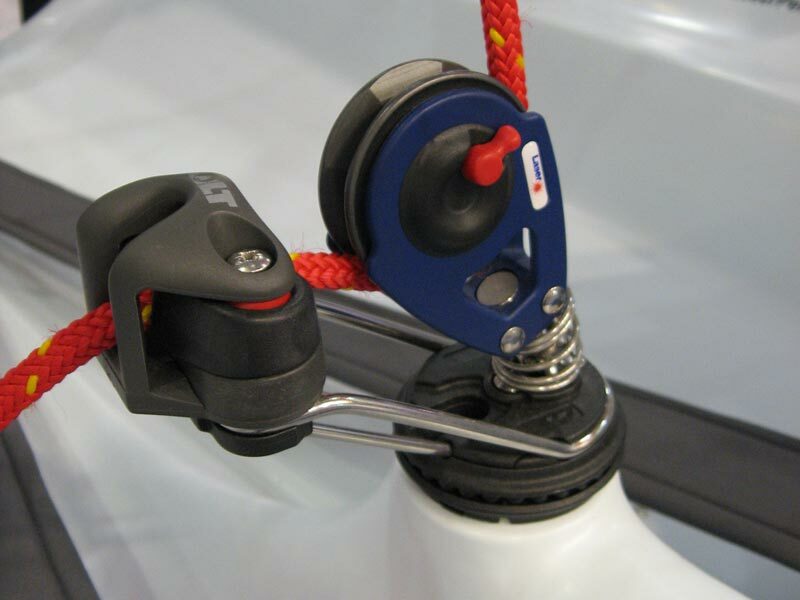 Usually a tiller extension is found on the tiller also; this is an extended rod on a pivot joint which allows the helm to sit further forward and away from the rudder than they would be able to otherwise, and still maintain control of the boat. There will usually also be a method by which to raise and lower the rudder; some boats such as toppers have a mechanism built into the rudder and tiller, but others such as the Enterprise typically have a rope to pull to raise the rudder, and a piece of shock cord to pull on to lower it and tie it off; shock cord is used so if the rudder hits anything under water, it can spring up slightly, which it wouldn't be able to do if rope was used. On extremely high performance boats, foiling centreboards or rudders can be found; these are usually longer than normal, and will have several horizontal extensions coming off them; the purpose being that when going at speed, they act as hydrofoils, and the entire hull will actually lift out of the water once a certain speed is reached, causing less resistance and drag and giving even more speed. This is a sight to see as you can imagine, and not many boats can do this; notable examples are the International Moth, and the RS600 which can be fitted with a foiling kit. So as you can see, boats are complicated pieces of kit - but don't worry. Once you've been around boats for a few weeks or months, it'll all fall into place, and you'll soon be wowing your friends by explaining all about double trapeze asymmetrical planing hulls with centremain systems and a foiling kit!